Thanks to those of you who played along with Friday’s Mad Libs post. (Yes, even impatient AmberWaves. :)) Here’s the text you can use to plug in all your answers. Doing laundry (3) for at least (4) people in a washing machine the size of a (5). Coming up with something to cook for dinner every night even when you only have (6) in your cupboards. Cleaning the house until the floor’s so clean you could (7) on it. Creating and maintaining a discipline plan to ensure that children (9) (10). You don’t have to do it all alone. You could also make a (11) chore chart and sit back and watch while the children (12). (15) people need not apply. Oh, and remember that in heaven, you’ll get lots and lots of (16). Just for fun, I picked some of my favorite answers among all of your entries and put together a communal job posting that brings a smile to my face. I linked each term to the clever lady who provided it. Doing laundry wistfully for at least 47* people in a washing machine the size of a tractor. Coming up with something to cook for dinner every night even when you only have garlic, almond extract and brown sugar in your cupboards. Cleaning the house until the floor’s so clean you could germinate on it. Creating and maintaining a discipline plan to ensure that the children bemoan, tease and howl cheerfully. You don’t have to do it all alone. You could also make a polka-dotted chore chart and sit back and watch while the children laugh. Beautiful people need not apply. Oh, and remember that in heaven, you’ll get lots and lots of babies. So, what do you think? Would it be fun to do it again sometime? I like the sentence “Beautiful people need not apply” (I’ll for sure get the job!) and the chore chart that makes the children laugh. That was fun! Thanks, Steph. I needed that giggle today. That was very fun! I would have participated too, if I had been online more over the weekend. I could really do with a washing machine the size of a tractor! 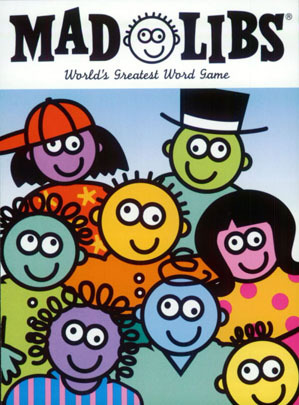 I love mad libs. It would definitely be fun to do it again. It was worth the wait. 🙂 Thanks for the smile-making fun. Why didn’t I play? This was delightful! It was good enough to get me to delurk! See! Yes, please do it again! So cute! I love that “beautiful people need not apply”! LOL. Love it!!! I love that mine said, “Worn-out people need not apply.” Haha. Isn’t that the truth.